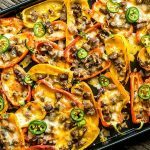 Low Carb Nachos are an easy low carb snack filled with chopped steak, lots of gooey, melted cheese, and fresh jalapenos, all baked into mini peppers. In a skillet cook your preferred meat adding cumin, chili powder, and salt as it cooks. Place mini sweet pepper halves on a sheet pan. Sprinkle cooked meat over mini peppers trying to keep it in the peppers so it doesn't fall through to the pan. Cover mini peppers with shredded cheese and jalapeno slices. Place in oven set to BROIL for 5-6 minutes or until cheese is fully melted. Add any low carb nacho toppings you like. Note: For the best flavor cook the meat of your choice with 1 tablespoon of cumin, 2 tablespoons of chili powder, and 1/2 teaspoon of salt. Disclaimer: We are not nutritionists. The nutritional values were calculated using MyFitnessPal.com and should serve as a guide. Results may vary. These values are for 1 pan of Low Carb Nachos with ground beef, cheese, and jalapeno. No other toppings were included.